The Honest Consumer works with social enterprises and ethical brands to empower conscious consumers. 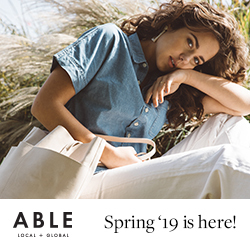 By sharing the stories of socially responsible companies The Honest Consumer encourages consumers to support social enterprise and ethical fashion with their purchase power. As an ethical fashion blogger, The Honest Consumer has created lists of ethical brands, guides to ethical fashion, and found ways for beginners to start their conscious consumerism journey. 5028 is a small-batch artisan shoe company focused on the art of crafting shoes through ethical practices and upcycled materials. Their limited edition shoes are crafted with deadstock materials making their shoes extra special due to only producing up to 250 pairs of a particular style/color. 5028 furthers their social impact by donating $5 from each pair sold to mental health support groups. For tips & tricks on conscious living, ethical fashion, and social impact be sure to follow The Honest Consumer on social media!